ParkeKC GAA Club was formed in March 1970 and in the following month the West Mayo GAA Board accepted the clubs application to compete in their divisional competitions. Twice in the previous decade attempts had been made to establish a club by calling a special meeting, presided over by the late Canon Michael.F. Hennelly P.P Parke, no positive decision was reached and so the idea drifted for the time being. During that era players from the area were assisting other clubs namely Ballyvary. A new brand of enthusiast under the direction of Fr. Michael Comer C.C Crimlin met to re-assess the thinking of a few years previous and went forward by forming a club, which was a historic move, which in the past 40 years has seen the cementing of great friendships within the community at various levels. its activity centered on what the founders of the G.A.A had wished for the playing and fostering of our native games and pastimes. Prior to their first engagement in the West Junior Championship the club had two challenge outings against Breaffy and Castlebar with the loan of jerseys from De La Salle College in Castlebar. The first two competitive games resulted in wins against Breaffy B on April 12th and a week later against Louisburgh at Turlough on a score 2-8 to 1-7. Interesting to note nowadays that club competition isn't generally featured when our inter county team are playing important competitive games but not so on that eventful day in Walter Durcan's field in Turlough 1970, when players from both sides listened to that exciting voice of Michael O' Hehir over the radio when describing Mayo's survival against Derry in the National Football League semi final by a narrow margin of one point. On Sunday, April 26th 1970 saw the clubs now distinctive colours of Black and Amber on display for the first time in an away game, but the joy of sporting our new wears was overshadowed by a defeat of 1-8 to 0-02. Further on in the clubs fixtures some formidable opposition was brushed aside by the attractive free flowing style of the Parke lads and ended up that season by taking the West Junior B title against Breaffy having accounted for Kilmeena in the semi-final. 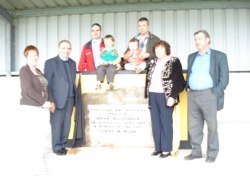 The official opening of the new stand was dedicated to the memory of Jimmy Mc Hugh, Carrowkeel- a most talented player who gave loyal service to his native Parke GAA Club. Having played at U-12 level in his first venture on the playing fields, his skills had progressed rapidly by the time he was involved in the West Mayo U-14 Championship. Jimmy had the honour of captaining his team to divisional success in the 1982 B Championship and also to victory in the county decider in which it took three exciting matches to eventuallyovercome North Mayo champions Bonniconlon. The drama that unfolded in those games is still fondly recalled. His best postition at underage level was wearing the number 3 jersey at full back, where his strong physical build enabled him to have a commanding presence in front of goal. so often during a game he was involved in the thick of the action and he was always noted for his wonderful sportsmanship and setting high disciplinary standards. Jimmy also excelled at U-16 level and gained recognition at county level when he lined out for Mayo in the Ted Webb Provinical Competition in 1984. That year also marked the centenary of the Gaelic Athletic Association and he was chosen to be the Mayo underage representative when the GAA staged a special opening ceremony of celebration at Cusack Park in Ennis on March 17th that year. He was also an outstanding player at schools level and won several honours playing with Davitt College Castlebar. Jimmy also played with Athlone IT in the Sigerson Cup Competitions and on completion of his studies there he graduated in 1990. His acdemic achievements resulted in him taking up employment in Scotland and it was there that a tragic road accident took him from our midst in December of 1996. Underage football within our club is run under the auspices of the Bord na nòg. As well as the clubs officers, an active and efficient Bord na nòg committee is in place. This coupled with the excellent support of parents and the support of the broader community contributes to the efficient running of the activities of our club. it is an aim of the club that through the adoption and promotion of core values including participation for all, fairness, inclusiveness and hard work, that an environment will be created that allows all children enjoy the clubs activities as well as reaching their full potential. There are currently in excess of 75 under 10 boys registered and the coaching and development of this group is a priority for our club. Activities for this group are centered on weekend training as well as matches and blitzes - primarily over the summer months. The introduction of "Go games"nationally from 2011 onwards for all competitions from U-12 and below will throw up challenges as well as opportunities that hopefully the club can meet and benefit from. Other initiatives that have been introduced include the summer Cùil Camp, the club coach that visits schools in the clubs catchment area working on improving basic skills with pupils in 1st to 6th classes. A strength and conditioning programme for the 15 to 17 age group has commenced in 2010. Our club participates in U12, U14, U15 and U16 league and championship competitions. An increasing competitiveness at all of these levels through the commitment and hard work of Managers/Coaches augers well for the future. Our club has also forged close links with the local Community Games Organisation in particular with regard to the annual football competition at U-10 level. The continued support, assistance and co-operation with the Senior Club has been a significant factor in the continued growth and development of the Bord na nòg over the past number of years. *view pictures of our under age in our photo gallery which is available under the Bord Na n-Òg tab. During the course of the 2007 and 2008 seasons the number of girls at training had increased at under 8 und under 10 but on observation the numbers declined by under 12. We noticed at training at training they weren't expressing themselves as we felt they could. Despite the excellent coaching at underage level we started to train the girls in the 2009 season seperately on a trial basis. The improvements were dramatic and their confidence levels increased two fold. The numbers started to steadily increase as word spread throughout the community. With the help and backing of the Bord Na n-Òg Committee it was decided to affiliate to the Ladies Gaa Committee under the umbrella of the Bord Na n-Òg , to organise football for girls within the club to which we are extremely grateful. Word spread among the girls of the parish and at the Bord Na n-Òg registration night in January over 50 girls registered for the year 2010. Training commenced in March on Sunday mornings and history was made in early May when the first girls' teams from the parish took to the field playing challenge matches at under 8 and under 10 levels against Breaffy.